Tahini is a sesame paste, most often used in Middle Eastern recipes. Texturally, it is most comparable to smooth peanut butter, with the same mouth-coating property. In the UK tahini is most commonly found along with chickpeas in hummus. In The Middle East, sesame is often associated with sweetness, as tahini makes the base of the popular confectionery, halva. The most common type of tahini is a 'light roast', made from hulled white sesame seeds, which have been roasted and then milled. Unhulled seeds make a stronger and darker tahini, and black sesame seeds can even be used to make a dramatically-coloured paste. Tahini's high calcium and protein levels make it a popular ingredient amongst vegan chefs, and raw tahini can be purchased at specialist or health food shops to cater for specific diets. Regular tahini is now available in most big supermarkets, and many now have own-brand versions. Tahini hardens in the fridge, and the seed oil often separates from the paste, meaning that it needs stirring before use. If using tahini in a a sauce or dressing, do not be afraid to loosen it with a splash of water, so that it has a better consistency. For desserts, use tahini as you would with any other nut paste. Stir it into a sweet custard for panna cotta or ice cream, and add it to sponge mixtures or biscuit dough to introduce sesame flavours to a sweet bake. 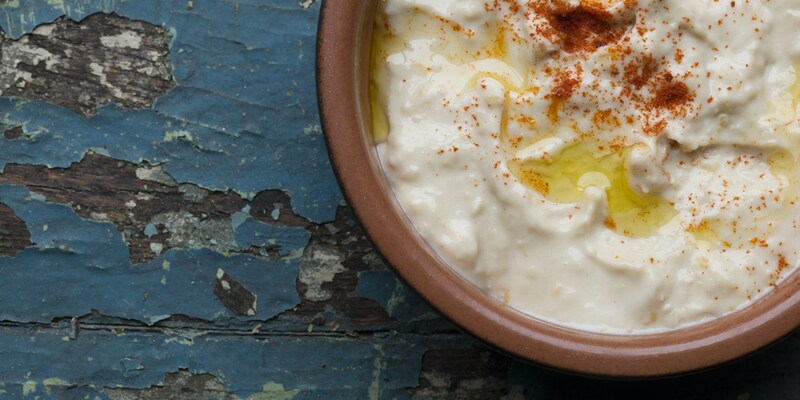 Tahini is the key ingredient to an authentic hummus, and naturally partners other Middle Eastern ingredients like za'atar, roast peppers, chickpeas, coriander and vine leaves. Tahini is also key when making baba ganoush with the sesame complimenting the aubergine, lemon and garlic, as Bryan Webb demonstrates in his recipe for Aubergine purée served with red mullet. For dessert, tahini works well with chocolate, and other nuts like pistachio and pecans. Josh Eggleton's recipe for Hazelnut and sesame mousse cake with malt ice cream showcases tahini in a sweet context.